Cabelas has a Wüsthof Classic 6" Cook's Knife with Cutting Board, $49.99 free in store pickup, Free Shipping $99 with code: 47FREE. Expires Soon - Knife ALONE costs $70 at amazon. 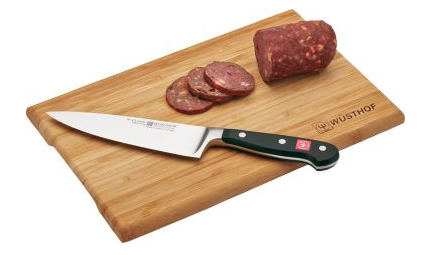 Cut, chop, slice, mince and dice meat, vegetables and more with Wüsthof's Classic 6" Cook's Knife and Bamboo Cutting Board. The full-tang blade on the Cook's Knife is made of high-carbon stainless steel, while the highly durable polyoxymethylene handle resists fading and discoloration.